The Volunteer Hotel stood on the corner of High and Hunter Streets beside E. P. Capper & Sons. This building erected in 1940 was also destroyed in the fire of 1971. 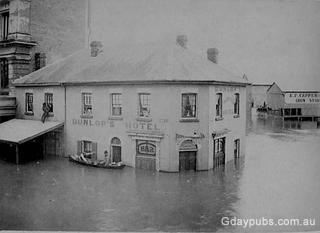 The Volunteer Hotel was mentioned under “Abstract of Sales by Auction” in The Maitland Mercury in 1874 as the venue for a sale by Brunker & Wolfe.
" I have attached a page from a booklet which I produced for Maitland & District Historical Society that contains a photo which is possibly the first “Volunteer.” This building was demolished in 1939 and a new Volunteer completed and opened in 1940.